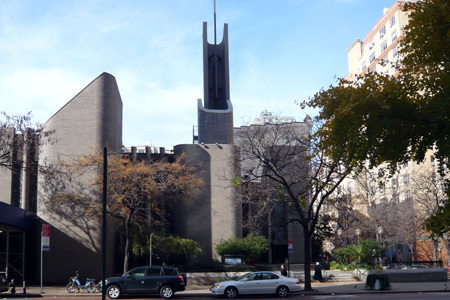 The church: Church of the Epiphany, New York City. The building: Built in 1966 by the firm of Belfatto & Pavarini, known for their modernist structures. It replaced an earlier 1870 structure destroyed in a fire. The exterior features plain-Jane, brown brick, blunt-edged columns of various sizes in asymmetrical placement and a large, soaring, broken column suggestive of a bell tower. And as brown as the exterior is, the interior is a riot of color, dominated by monumental walls of lovely stained glass in both the sanctuary and vestibule that also serves as a baptistery. There is something of the "mid-century mundane" about the place. The church: They offer three masses daily during the week, two on Saturday and four on Sunday. They have a very large grammar school, as well as several outreaches including a young adults and prayer groups. The neighborhood: This is the Gramercy Park neighborhood. "Gramercy" is an Anglicization of the Dutch word meaning "little crooked swamp," and until the end of the 18th Century this posh area was a swamp. Developed along the London model in the 1830s as a private park surrounded by elegant townhouses, the park itself is gated and only residents of the area who have paid a fee are given a key. Throughout the years, the quiet streets that make up the area have maintained their status as fashionable residential blocks. Several popular restaurants and bars dot the area. The cast: I have no idea. He wasn't introduced anywhere and we didn't meet him on the way out. The date & time: First Sunday of Advent, November 27, 2011, 12.00pm. Slightly more than 100 and it was quite an elderly crowd. I'd say the average age was about 60. No. We arrived 15 minutes early and were the first in the pews. A bit earsplitting. During what had been a very nice meditation on the piano, the sound system started acting up, producing an ear-splitting sound that rose to a crescendo of air-raid siren proportions. The music director had some trouble sorting it all out. The priest tried to light the first candle in the Advent wreath using a cigarette lighter, but the candle just wouldn't take the light and he finally gave up trying. Sort of a bummer! "Welcome to Epiphany. The first hymn is number 14." Breaking Bread 2012 and a stack of cards with the order of the mass on it. There was also Magnificat Roman Missal Companion and The Word Among Us, a devotional magazine published monthly, for everyone to take home after mass. Organ, piano, and a choir of eight seniors of varying talents. There was one bass who tended to overpower the rest of the singers. The music director gave an impassioned plea during the announcements asking for people to join the choir. There was an elderly lady in front of me who couldn't figure out how to silence her cell phone. At first she didn't realize it was her phone making the noise, and then when it finally twigged it was hers, she couldn't figure out how to turn it off. Before I could offer to show her how to stop it, she buried it in her bag under a bunch of stuff wrapped in her scarf, but you could still hear it bleating, albeit less loudly. How about "totally at sea"? I do think massive amounts of confusion could have been avoided if the priest had simply followed the order of mass as printed in the new Roman Missal. But he decided for some reason to begin by skipping the penitential act, and it was sort of downhill from there. I'm guessing that half the people just said the responses they knew, not bothering with all the changes. 6  It's really hard to judge. The room was acoustically very live, and the priest had to pause after every third word or so to make himself understood. That, coupled with his accent, made it very hard going. It also made the sermon seem interminable. Advent has three faces: first, the coming of Jesus, as prophesied in Isaiah; second, the coming of the Holy Spirit in our lives every day, working through the sacraments; and the third, coming at the end of time. Watching people grapple with the unfamiliar, trying to engage with the new liturgy in a meaningful way. Definitely the sound system! I couldn't figure out why they were even using a sound system in the first place given the intimacy of the space. Perhaps it was for the benefit of all the seniors? Nothing. There was an usher checking to see that the cards were left in the pews, but nobody approached, so we left. 5  A bit far for me to travel for it to be my regular church. Yes, but I did have to wonder if there were any native English speakers among the translators of the new mass. Some of it doesn't exactly come trippingly off the tongue. The word "consubstantial" seemed to bother one gentleman in particular, as will be seen. Overhearing the man in the pew behind me saying, "Cons... consub... what the h___?"